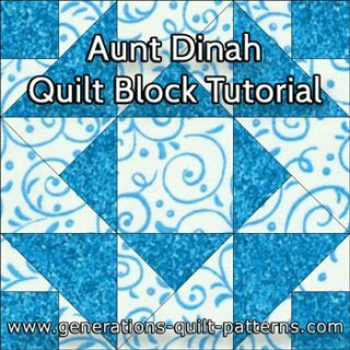 The Aunt Dinah quilt block looks complex, but when you break it down into its individual parts, you see it's nothing more than 3-patch quarter square triangles and Brave World units. Paperpiecing is the technique we'll use to keep those points pointy and intersections matching perfectly. 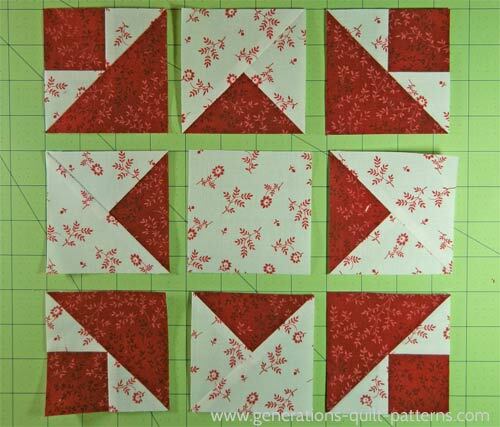 You'll find free pattern downloads below for 6", 9" and 12" blocks. To press, first do it with the unit closed to set the seam. Then open the patches and press from the front to minimize the creation of a tuck in the seam allowance (SA). If you choose to starch your fabrics (and I do! ), you'll find that you can fingerpress most of your seams. Try my favorite pressing technique, for the flattest blocks you'll ever see. It even works for paperpiecing! Choose a 'finished size' for your Aunt Dinah block. 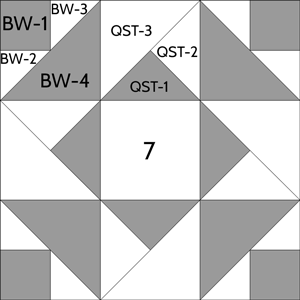 Then cut the patches and print the paper piecing patterns listed in the column below it in the chart. 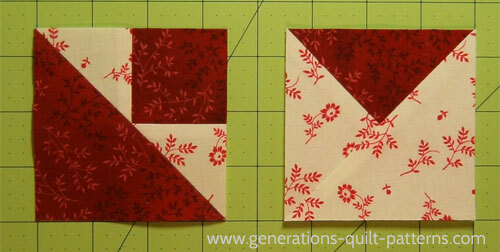 We'll be using both the 'Brave World' and 3-Patch Quarter Square Triangle paper piecing patterns to make this block. 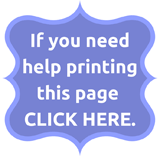 Unless otherwise noted, print one copy of each pattern. 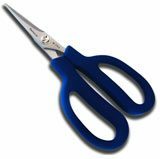 The links to download the patterns are in the cutting chart below. Look for good contrast between your two fabrics so that the points don't get lost. Some of the cut patches look very much like one another. 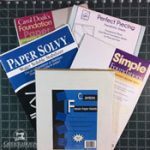 To keep them separated, label a sheet of copy paper with 'Brave World' and the other with 'QST' and then put the associated patches on them. 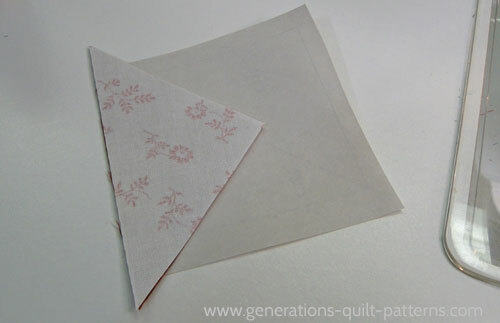 Or just print an extra copy of the pattern itself to use in the same way and keep your notes on. 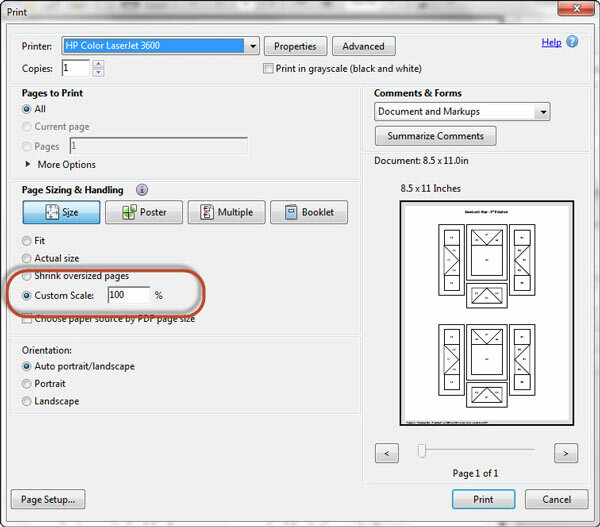 Cut four units from each pattern you downloaded/printed. A rough cut will do, nothing fancy because you'll trim everything once the unit is pieced. 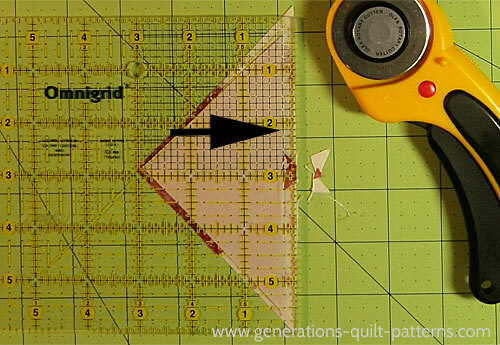 Reduce your stitch length to 15-18 stitches/inch for paper piecing. 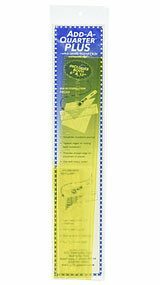 This helps make removing the paper easier. 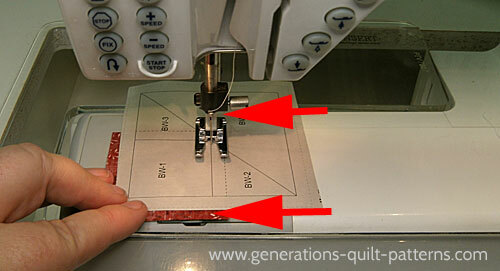 Install an open toe applique foot (if you have one) for an unobstructed view of the stitching lines. 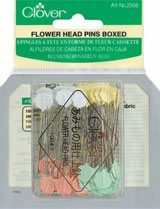 With a teeny dab of Elmer's Washable Glue Stick adhere the wrong side of a BW-1 patch in position on the unprinted side of the pattern. Use the dashed lines to accurately and quickly position it. 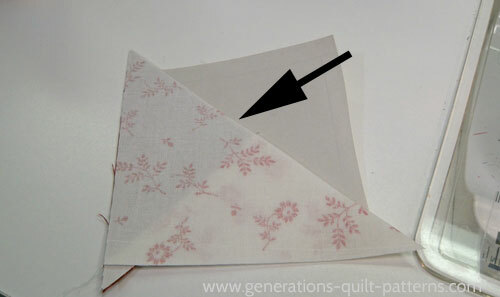 The outside edges of the fabric will extend past the dashed lines around the outside of the block on purpose. 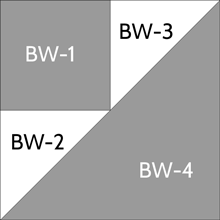 With right sides together (RST), align a short edge of a BW-2 patch with BW-1. Stitch on the line between them, starting before the line begins and ending after it stops and outside of the outer dashed line. This helps secure the seams. There's no need to backstitch. Add the background BW-3 triangle in the same manner and press. 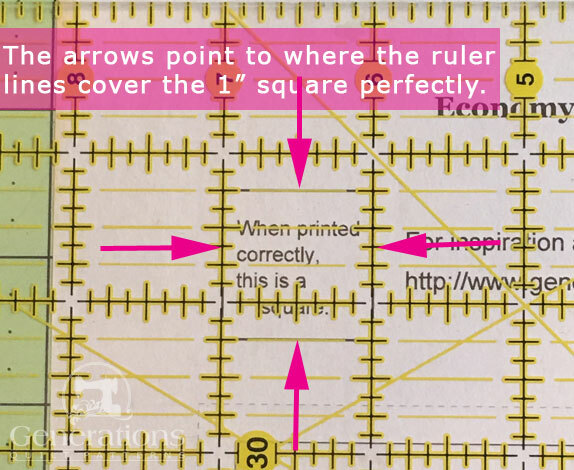 Reposition your ruler with the 1/4" mark along the fold and cut with your rotary cutter. This establishes your next placement line. With RST align the long bias edge of BW-4 with the sewn patches. Stitch starting before and ending after the line. Trim to size. (This is found in the chart at the intersection of the 'Finished Block Size' column and the 'Trim to Size' row in the Aunt Dinah block cutting chart above. 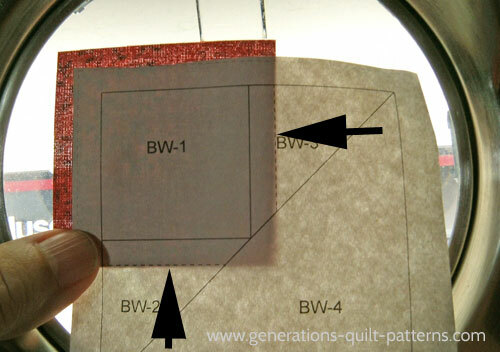 Use a dab of Elmer's glue stick to adhere the wrong side of QST.1 to the unprinted side of the pattern. The outside edge of the fabric is supposed to extend past the outside dashed line. The excess is trimmed later. 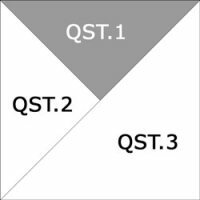 With RST, align the edges of a QST.2 with QST.1. From the printed side, stitch on the line between them, starting and stopping about a 1/4" past the ends of the solid line. 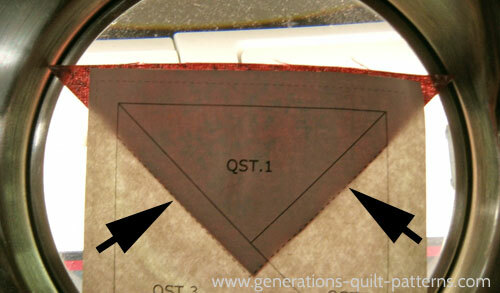 Align the long bias edge of QST3 with the sewn edges (black arrow). 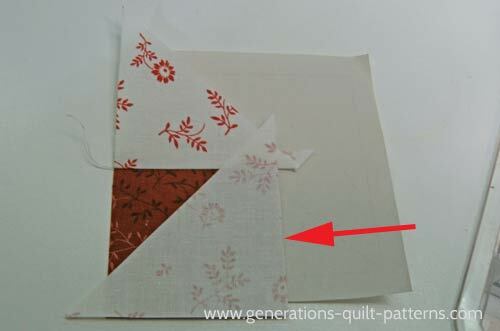 Stitch this seam from the printed side, starting and stopping past the dashed outline of the block. Press. Trim to the same size as the Brave World unit. 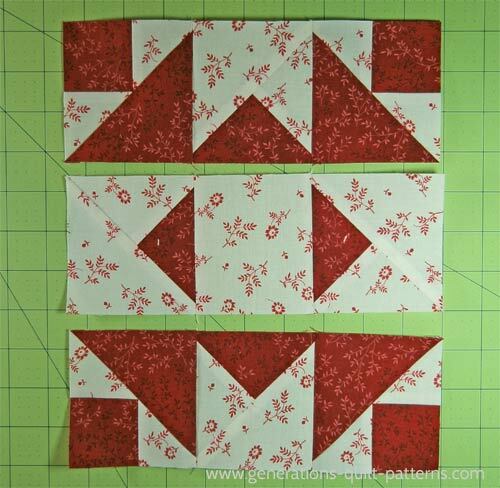 For more detailed directions, visit Technique #4: 3-Patch Quarter Square Triangle. This is what the two finished blocks look like. Trim any errant thread tails. Remove the paper. Brave World (l), Aunt Dinah (r). Make 4 of each. 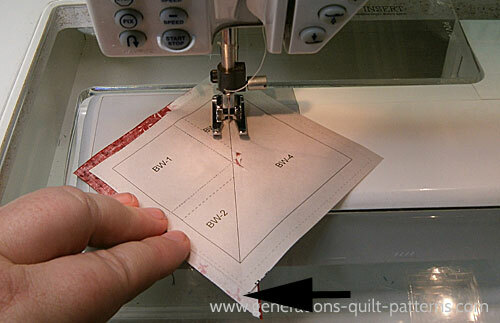 Return your machine to a normal stitch length. Install your preferred quarter inch foot. All SA for the remainder of this tutorial are 1/4". Lay out the pieced and cut unit(s) in rows. 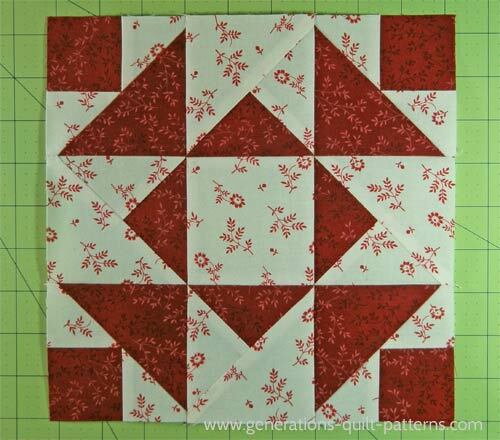 The 3-patch quarter square triangle creates the illusion of a square-in-a-square block in the center. 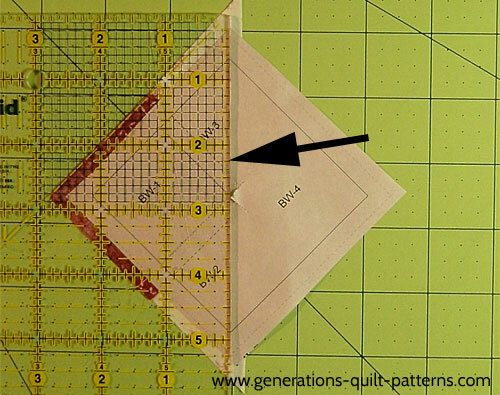 Notice, too, how the diagonal seam of the quarter square triangle automatically rotates a 1/4 turn as it moves around your Aunt Dinah quilt block. Stitch the units into rows. Press the SAs in these rows away from all the QSTs. The top and bottom row SAs are pressed to the corners; in the middle row they are pressed to the center. Our finished Aunt Dinah block looks like this. Pointy, crisp and ready for a quilt! Our Aunt Dinah block is finished! ...cookin' up more blocks for you to make. 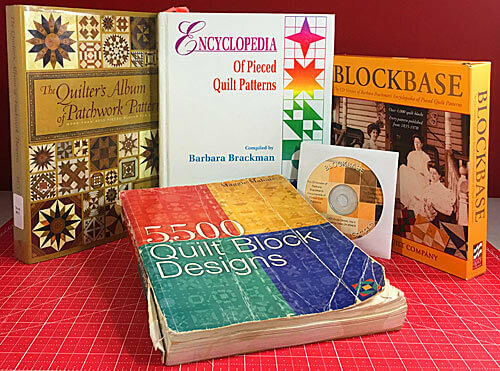 Find them in our Free Quilt Block Patterns Library which lists all the free blocks, instructions and downloads available to you on this website.